At Golden Perfect, returns are easy! We strive to offer the best shopping experience, including fast and guaranteed refunds. Products with no quality-related issues can be returned within 7 days of receiving your order. Overdue, exchange is not available. For Made-To-Order wigs, if the items were made accurately according to your order specifications but do not fit or dislike.You will be responsible for all shipping fees. We guarantee all of our products against material and workmanship defects as we described. If not We will be responsible for all shipping fees for exchange. 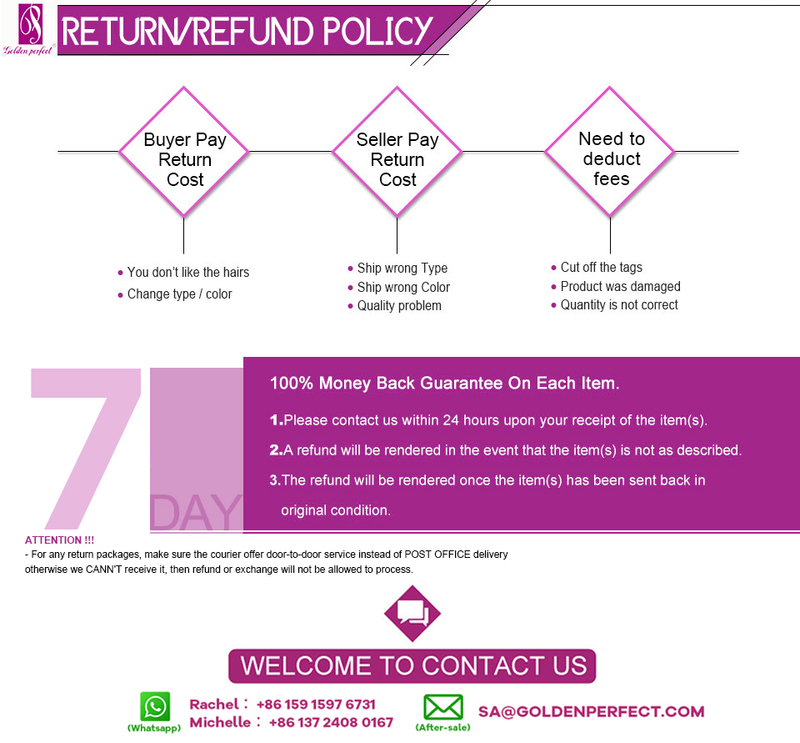 Or Refund will be automatically applied to your credit card or original method of payment within 7 to 10 business days once we got the return items. Note: In order to make sure that we are able to receive your returned package, please be sure to contact us before sending it back. We have every right to refuse to sign for the package if you send it back WITHOUT our permission! Otherwise, you will be responsible for all the losses arising there from.